Not that those of us who hike/walk have to be told, but check out the link below for some great information on the benefits of walking. It fascinates me that an activity as simple as walking can have such a profound effect on your overall health. Happy reading and as always, Happy Hiking!!! This entry was posted in Uncategorized and tagged blue zones, health benefits from walking, Hiking, Hudson Valley Hiking, hudson valley ny, Music, steven wright, Walking, walking quotes on July 14, 2018 by The Zen Hiker. It was another beautiful morning here in the Hudson Valley for hiking! When I started at 5:50 am, it was a pretty chilly 52 degrees with clear skies. What a great day to be out in the woods! Today’s hike was a decent one. I did my favorite Red Trail, came back around and then figured I would also do the Green Trail as well. Excellent hiking! Since I am having some issues downloading pictures, today’s post will be photo free!!! This entry was posted in Uncategorized and tagged green trail, Hiking, Inner Peace, Nhat hanh, peace, red trail, tranquility, Walking, walking as meditation, walking quotes, ward pound ridge reservation on August 28, 2017 by The Zen Hiker. Compare this picture to the one taken a few days ago. You can feel the humidity sitting on you just looking at it! Since I didn’t get out yesterday, I knew that I had to do a hike today. Since the forecast today is for a high of 84 degrees with a real feel of 93, it was important to get out early since I tend to sweat profusely on days when it is in the mid 20’s! Starting out at 5:50 am, the temperature was already 72 degrees with the humidity hovering at 94 percent. Needless to say, it didn’t take long for the water to start running off of me. I don’t think that I need to state the obvious but I will anyway. It’s days like these that remind me of the importance of making sure that you stay hydrated when you are out in the woods. Before I even left my house I made sure that I drank 48 ounces water. I then brought another 96 ounces for the hike. Since I knew that I was going to be hiking between 6 and 6 1/2 miles, I knew that making periodic water stops would be crucial. With heat index already in the 80’s (remember, the sun hasn’t even risen yet!) making sure that you drink enough water and not running out of water can be a delicate balancing act. This is why when I plan a hike I try my best to factor everything (weather, terrain, difficulty) into how much water I will need to bring. 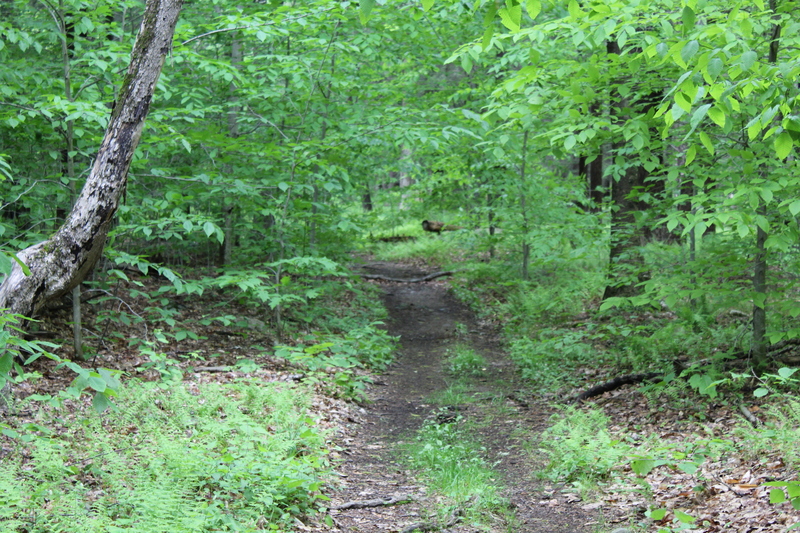 Today I ended up doing the Red Trail again at Ward Pound Ridge Reservation as well as a little extra. Since I have already done this hike, I won’t bother to write it up again except to say, IT WAS HUMID!!!!! This entry was posted in Uncategorized and tagged Henry David Thoreau, Hiking, Hiking photography, hiking safety, Hudson Valley Hiking, hydration, Inner Peace, peace, Photography, red trail, tranquility, Walking, walking as meditation, walking quotes, ward pound ridge reservation on August 19, 2017 by The Zen Hiker. Today (8/14/17) marked the third day out of the last four where I have hiked at Ward Pound Ridge Reservation. As with the first two hikes, I have never hiked the Red Trail prior to today so I was hoping that it would be as good as the others. Needless to say, even though this one was the longest, I enjoyed it the most. The trail varies from soft earth to rocky and had a minimal amount of ascents. With that said, none of the climbs were that bad. As I pulled into the parking lot I was met by this wonderful metal sculpture. Just awesome! Starting on the right just off of the Michigan Road parking lot, you will pass a gate with a kiosk filled with the usual warnings. After looking at the map and reading the section on the Red Trail in Walkable Westchester, they even recommend tackling this hike in a counterclockwise direction. The Red Trail begins and ends just after the kiosk. Immediately after the kiosk, the Red Trail starts off level and on soft earth. As you wind your way through the park, the surface of the trail changes throughout the duration of the hike. Earth, rocks, gravel, this trail has it all. The one very cool thing about this Ward Pound Ridge is that they have cabins and shelters scattered throughout the park. This one happened to be just off the Red Trail. Here are some interesting rock formations along the trail. This entry was posted in Uncategorized and tagged Hiking, Hiking Pictures, Hudson Valley Hikes, Hudson Valley Hiking, hudson valley ny, Inner Peace, jane and walt daniels, paula cole, peace, Photography, red trail, thomas jefferson, walkable westchester, Walking, walking as meditation, walking quotes, ward pound ridge reservation, westchester county ny on August 15, 2017 by The Zen Hiker. As I was looking for quotes to put with my last post, I came across two that were a little lengthy but convey how I feel every time that I am in the woods. They are both by Frederic Gross from his book A Philosophy of Walking. Feel free to read them and leave your thoughts in the comments section. This entry was posted in Uncategorized and tagged a philosphy of walking, frederic gros, Hiking, Hudson Valley Hiking, Inner Peace, peace, tranquility, walking as meditation, walking quotes on August 9, 2017 by The Zen Hiker. The weather for hiking this summer has been pretty good. Even though we have gotten more rain than in past summers, we have only had just a few days where the temperature has actually got into the 90’s. The Hudson Valley has also been spared the oppressive humidity that usually define the months of July and August. Until today. With the temperature hovering just around 70 and the dew point being just as high or even higher, I anticipated sweating even more than normally do! As usual, I got to the trail at about 6:30 am and was hiking before 6:40. Starting at the kiosk on the Long Path, the trail starts off level and then heads sharply downhill. The beginning of the hike on the Long Path. After hiking for around 10 minutes, you will cross paths with the Popolopen Gorge trail on the right. At this point, stay on the blue blazed Long Path where you begin a relatively steep and winding climb to get to the top of Long Mountain. Once you get to the top, not only do get some awesome views, but you see this memorial. The Raymond H. Torrey Memorial on top of Long Mountain. Turkey Hill Lake from Long Mountain. The opposite side of Bear Mountain. Note Perkins Memorial Tower on the right hand side of the picture. Looking towards NYC from Long Mountain on a really hazy day. After spending some time checking out the views, I pulled out my map and saw that the descent looked like it might be steeper than the ascent. It also didn’t help that it had rained the night and added with that some steep drop offs to the left of the trail, the way down was more than a little treacherous. I actually slipped a couple of times and thought that the end might be near! After getting to the bottom, the Long Path continues straight ahead. You should take the woods road that cuts sharply to the left and follow that until you meet up again with the Popolopen Gorge Trail. Remain on the PG Trail until you get to Turkey Hill Lake. Turkey Hill Lake. Long Mountain is in the background. As I made my way around the lake, I came across this shelter. It was actually very well built and looked as though it would keep you relatively dry during a rainstorm. Obviously someone had some time on their hands to construct this shelter. The tail end of Turkey Hill Lake. A small flower alongside the trail. This entry was posted in Uncategorized and tagged 1779 Trail, Bear Mountain, Harriman State Park, Henry David Thoreau, Hiking, hiking quotes, Inner Peace, John Lubbock, Long Path, Nature Photography, peace, Photography, Popolopen Gorge Trail, Turkey Hill Lake, Walking, walking as meditation, walking quotes, wilderness on August 5, 2017 by The Zen Hiker. Since I started blogging, my goal has always been to document every hike that I do. Sometimes I do the same hike during different seasons so I can show how the views change over time and season. And some, I just do over and over and over because they are awesome and convenient hikes. Anthony’s Nose is a good example of this. In an effort not to bore anyone that might actually be reading my posts, I’ll keep them short and sweet from this point on. Since the heat and the humidity have refused to loosen their grip on our area, another trip to the Nose was just what was needed to get a short hike in before the heat of the day. Looking at the Torne from Anthony’s Nose. A short distance from the Nose is another view-point. Looking up the Hudson from the alternate view-point. This entry was posted in Uncategorized and tagged Anthony's Nose, Blogging about Hiking, Hiking, Hiking Pictures, Hudson River, Hudson Valley Hikes, jean jacques rousseau, Photography, w.j. holland, Walking, walking as meditation, walking quotes, wilderness photography on July 23, 2017 by The Zen Hiker.